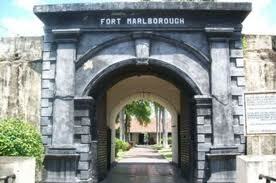 Fort Marlborough is the largest fortress castle built by the British colonial rule in Southeast Asia and is located in the center of Bengkulu city overlooking the sea. Fortress Marlborouh measuring 240 x 170 meters with square shaped. Although it looks impressive, Fort Marlborough only used twice that during the uprising by the people of Indonesia (1719) and by France in (1760). The British came to Bengkulu (Bengcoolen as the British) in 1685 and founded the pepper trading post. Nearly twenty years later in 1713, during the leadership of Governor Joseph Callet, they build the fort and completed the construction of the fort in about six years. British conduct of economic activities in Bengkulu with pepper trade business because of the lack of pepper on the ground around Britain, the British insisted to stay and survive in Bengkulu over the past 100 years until 1825. Under the Anglo-Dutch treaty of 1824, Bengkulu was later transferred to the Netherlands. 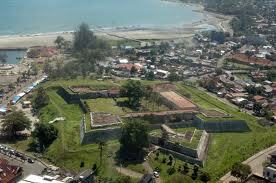 This fortress is located on a small hill overlooking the sea. Inside the fort there was a prison, arsenal, army barracks and a tunnel leading out of the castle. The entrance of the castle made ​​of large metal and thick. There is also a bridge with a length of 10 meters. No buildings on the center site, prisons, residential, kitchen and offices are built separately. There was also the stairs which led to the floor above, and you can overlook the Indian Ocean, on that floor there are some old cannons which still original.